After coming from a whole day of meetings and agendas, I have decided to cook Chicken Teriyaki for dinner. 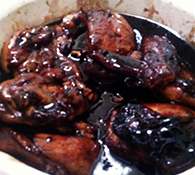 Actually, this is my first time to cook and bake a teriyaki dish. So what I did was, I researched first for existing recipes online. Some of them are either long to prepare or some of the ingredients are not available. Instead, I somehow mix and match them all together, and this is what I’ve came up with. The dish has a soft cooked meat and very tasty. So far Me, My Husband and Pao2x, enjoyed the dish. According to my husband he liked it and he wants more. And that’s all I need to hear, that my family loves and enjoy the food I cook. Hehehe! 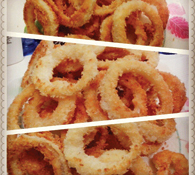 If you want to try my recipe then go ahead and I hope you like and enjoy this, the same way we did. Whisk in a bowl the soy sauce, sugar, ginger, garlic, vinegar, and honey; until the sugar is dissolved. Pour half of the mixture unto the chicken. Then set aside for 15-30 minutes to marinate. Just leave the remaining sauce for a while. Preheat the oven to 170 celcius. Prepare a wide cooking dish or pan and put a foil or baking paper. Place the foil / baking paper basin like to avoid the sauce to spill. Make sure that the chicken don’t cover each other and are evenly placed. Remove the chicken from the pan, leaving the sauce. Plate the chicken. Transfer the sauce into a sauce pan. 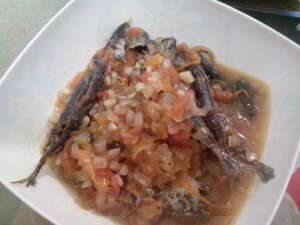 In a low heat, combine the sauce that came from the oven and the mixture that is left behind. When the sauce is boiling, put in the cornstarch. Stir until the cornstarch is dissolved and the sauce it thickened. Pour the thickened sauce unto the plated chicken. You can also also garnish it with spring onions, as an added color.